Starting your own small business can be quite daunting if it’s your first time, but with help, guidance and some trial and error it’s actually much easier than you think. But what happens once you’ve launched your store? The hard work is far from over, and if you haven’t already been considering your marketing plan then you’re way behind the curve. There are plenty of powerful ways to market your brand and business, though most methods can cost quite a lot to offer a valuable ROI. And that’s not great for small businesses looking to market themselves when just starting out. The older generation may prefer face-to-face chats or telephone calls, but social media is the realm of the younger generations. It offers an instant, direct line for your customers to reach you with any questions, comments – or even for a cheeky little chat. You can use social media for customer service in as many ways as you can imagine, for example monitoring conversations about your brand and rectifying poor experiences that have been mentioned online. This breeds loyalty and gratitude as well as happy customers. Sites like Twitter tell you exactly what’s trending at any given time through hashtags, but seasonal trends are global and ripe for taking advantage of. Think about the big ones: Black Friday, Christmas, Mother’s & Father’s Day and back to school – how can you market your brand during these periods? What’s happening with your store that your customers would want to know? Everyone loves a freebie. So why not offer some as prizes for your followers? Get your fanbase involved in competitions and giveaways and they’re more likely to respond to other social media updates too. And if you make an entry requirement to share your post then every person who enters will share your brand with their friends and family, potentially selling your brand to a whole new set of followers. If there’s something going on with your store, shout about it! New products? New designs? New shipping methods? But you can share more than just the basics. Social media is a great way to show off the personality behind the brand, so give your audience a behind-the-scenes look in to the life of your brand. Things like photo shoots, sneak peaks and products and the like are great ways to engage your customers without trying to sell them something. We all love to tell others about the awesome new stuff we’ve bought from such-a-place online. Social media platforms like Twitter and Instragram do the ‘guick update with a snapshot of what I’m wearing’ very well, and they make it really simple for others to share this content. If your customers snap themselves wearing or using your product then share it! It’ll showcase your products to anyone following you, but it’ll also give a confidence boost to original customer and they’re likely to buy again. 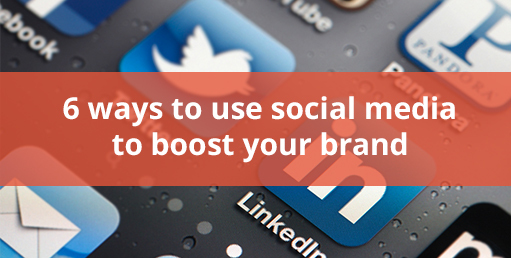 There are too many ways to effectively use social media to boost your brand to list in one article, meaning we’ve by no means exhausted the potential uses for these platforms. As with all things in life, the best way to learn is through research. Each platform has its own user base and tools that differ from the next, so it’s worth looking into which platforms are best for your business. For example, Instagram users share images with brief captions that can be categorised by keywords. It’s great for clothing brands who want to showcase their products, using trending keywords to have their images listed in the feeds of anyone interested. Used correctly, Instagram can deliver your products to the eyes of the customers looking to buy your product. If you’d like any help with social media, or have any comments or questions about how it can be used to give your brand a boost then get in touch with the Inkthreadable team through our Live Chat service, our contact form or by calling 01254 777 070.